These are the fingerprint baubles we made last year in the grotto that we are going to try make in the forest this year! 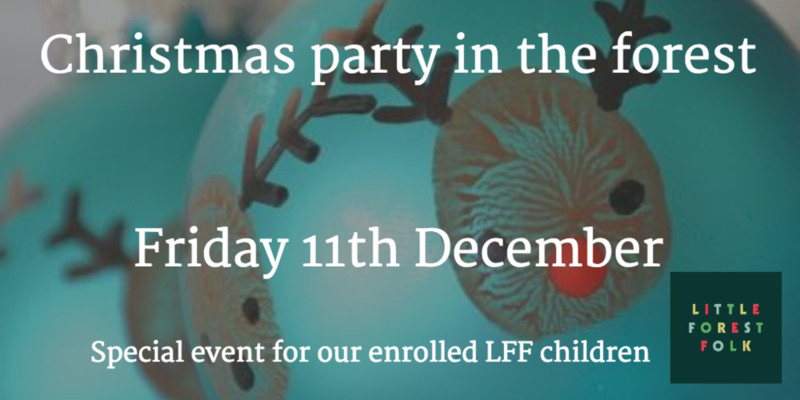 Any parents who haven't yet confirmed can contact lisa@littleforestfolk.com for further details. Note: This year our grotto is only available for our nursery enrolled children to attend as its a very special grotto in the forest and we need to limit numbers for the 120 enrolled children. There will be carols and marshmallows around the fire as well as other treats. We'll be making christmas crafts in the forest which will be lit up magically with fairy lights. Many thanks to all that have replied to say they are joining us on the 11th December in the forest for our Christmas party. We're looking forward to seeing you all there! We can now confirm the final running order so everyone knows the plan for the day. Parents to arrive at the forest, meet the team by the bench and collect their child. We'll walk parents and children into the forest, in groups. Pick up from the Scout Hut for any children that are with us for a full day on Friday and whose parents can’t attend. * Please ensure, when you arrive at the forest, that you notify a member of staff that you have collected your child. * A reminder to please dress warmly, wear your wellies and bring a torch.